Small flies in homes and greenhouses often turn out to be fungus gnats. 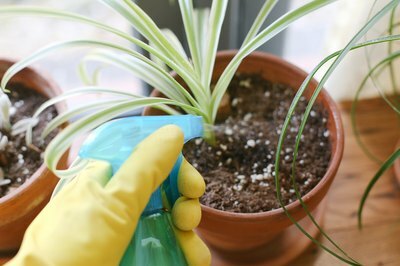 They may emerge from houseplants' potting soil when you water the plants, or they may fly out of a bag of potting soil when you open it. Fungus gnats rarely harm plants but in some cases cause damage by chewing plant roots. They feed on organic material in soil and breed beneath the soil's surface. Fortunately, following simple steps can prevent and kill these pests, removing them from potting soil. Fungus gnat adults look similar to mosquitoes. They usually grow roughly 1⁄16 to 1⁄8 inch long and are dark with long antennae and thin legs. Besides water, light attracts them. So you may see them near windows and lamps. Fungus gnat larvae are wormlike, live in potting soil and have black heads but otherwise whitish bodies. Very small slime trails on the surface of plant soil are evidence of the larvae. Letting plants' potting soil dry out between waterings helps to ruin fungus gnats' breeding ground. Good soil drainage facilitates that drying and prevents an overpopulation of fungus gnats. Remove fallen leaves and other organic material buildup from the soil to reduce the gnats' food source and to eliminate their hiding spaces. 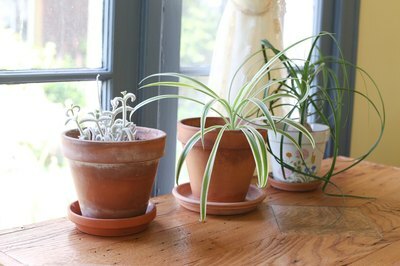 When it is time to repot your houseplants, use a sterile potting mixture. If a bag of potting mixture is infested with fungus gnats, then a solar treatment can salvage the mixture. Put the affected potting mixture in a clear or black plastic bag, ensure the soil pile is 8 inches or thinner and leave the bag in direct sunlight for four to six weeks to kill the fungus gnats. Sticky traps, which are available at garden stores, can trap adult fungus gnats. Ohio State University Extension recommends using yellow sticky traps. 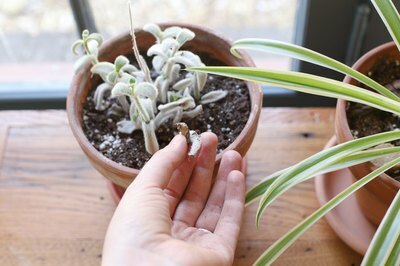 Place small sticky trap squares on wooden stakes sticking out of houseplants' soil. 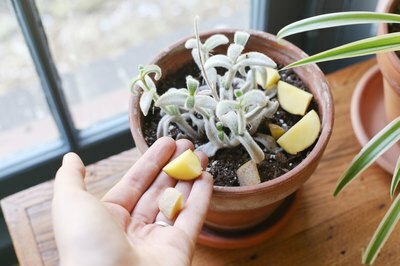 Trap fungus gnat larvae by placing chunks of raw potato on the surface of the potting soil. When the potato chunks become covered with larvae, throw them away and replace them with fresh potato chunks. Ensuring windows have screens and caulking around windows and doors thoroughly can help keep fungus gnats from returning. Natural predators of fungus gnats include the beneficial nematode Steinernema feltiae and the bacteria Bacillus thuringiensis subspecies israelensis, abbreviated Bti. Nematodes tend to work best when the soil temperature is between 60 and 70 degrees Fahrenheit. The University of Massachusetts-Amherst Extension recommends applying them in evening or on a cloudy day. They need to be mixed with water and applied with a sprayer, watering can or injector. When an injector is used, set the dilution rate at 1-to-100 -- 1 part nematode product to 100 parts water. Nematodes usually are available only through online or mail-order suppliers. Bti is often available at garden stores and plant nurseries. It is made in various concentration levels, and the concentration level determines the rate at which it needs to be mixed and applied; follow your product's label directions. The instructions for one product with a Bti concentration of 6.38 percent, for example, directs users to mix 1 to 2 teaspoons of the product with 1 gallon of water and to use the resulting solution to drench plant soil to cure a light infestation of fungus gnats. The instructions direct users to mix 4 to 8 teaspoons of that Bti product with 1 gallon of water if the fungus gnat infestation is heavier. Bti often requires repeat applications.